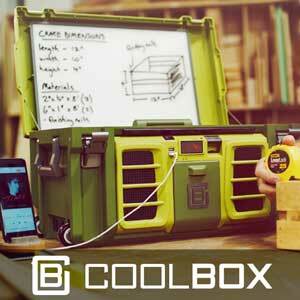 The Coolbox is loaded with features you’ve longed to have on the job site. It’s a USB charger for your phone or tablet. There’s an integrated tablet stand. It’s got Bluetooth speakers for cranking out your favorite tunes. A pass-through power strip supplies juice to your power tools. LED lighting floods the area with light so you can select and use the right tool. There’s a whiteboard in the lid for jotting down notes, dimensions, or a shopping list for supplies. Built-in batteries supply power to small tools and the clock when you’re not near an outlet.